As you can imagine I read a lot of food blogs on a daily basis. Some I read to keep up with new trends, some for the cooking advice/information they offer and some for their great recipes. The recipe below is one I found on Cinnamon Spice & Everything Nice...a blog I read for all of the reasons above. I would highly recommend checking out Reeni's blog; she has some delicious recipes like the one below. I've actually made this one several times it's that good. One thing I really like is the way it incorporates so many herbs. I was able to use all fresh from my garden which really made the flavors stand out. 1. Early in the day or a few hours before cooking whisk all the marinade ingredients together in a large shallow dish. Add the chicken and coat well on both sides. Refrigerate. 2. To make the ladolemono combine lemon juice, mustard, oregano, salt and a few grinds of black pepper in a small bowl. Whisk to blend and drizzle in olive oil. Refrigerate. It will separate so whisk well before serving. 3. Preheat oven to 400 degrees. Lightly grease a 9x13 baking pan. To make the filling use a fork to mash the feta cheese. Add the olives and gently mash them into the mixture, don't completely mash them just incorporate them into the feta. Take a chicken cutlet and using 1/4 of the mixture spread it from one end to the middle of the cutlet. Roll up and hold together with toothpicks. Repeat with the rest of the cutlets. Bake for about 20 minutes depending on the size of the cutlets(165-174 degrees). 4. Meanwhile in a large skillet saute onion in 2-3 tablespoons oil over medium-low heat until tender and translucent. Add garlic, saute until fragrant. Add couscous and more oil if needed. Saute couscous for 2-3 minutes. Add 1 and 1/2 cups of water. Bring to a simmer and cover. Simmer slowly for 10-12 minutes until water is absorbed. Turn off heat. Stir in tomatoes, cucumber and olives. Put lid back on and let sit for 5 minutes. Stir in parsley and season with salt and pepper. 5. 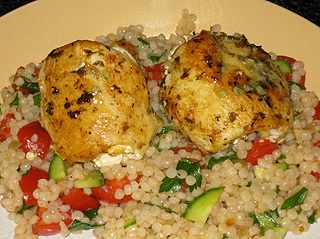 Serve chicken over the couscous drizzled generously with ladolemono. I'm so happy to see you making this - it's one of my favorites! Thanks for the kind words! I can't wait to make this! (I have chicken in the refrig now!) I love reeni's blog too! This looks beautiful - this is exactly my kind of dish, and everything I need is pretty much in season locally right now. I can see that I will be making this very soon. Thanks so much for stopping by my blog and taking the time to comment - I appreciate your visit and hope you'll come again.